COLUMBUS – SportsTime Ohio and FOX Sports Ohio have entered into a new multi-year television rights agreement with Columbus Crew SC and will be producing 33 Crew matches this 2019 season as well as 30-minute pre- and postgame shows. All coverage will also stream on FOX Sports GO. 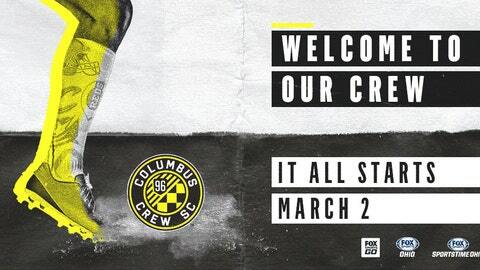 The first Crew match will be on STO this Saturday, March 2 at 4:30 p.m. 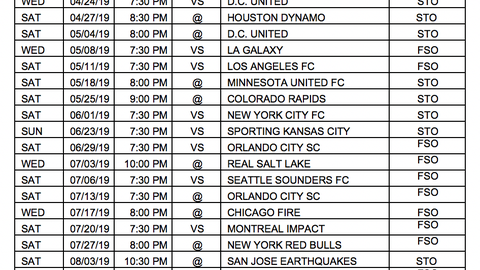 ET versus the New York Red Bulls with pregame coverage kicking off at 4:00 p.m.A complete broadcast schedule is below. The partnership also sees the return of Neil Sika and Dwight Burgess to the Crew SC broadcast booth, with Sika on play-by-play and Burgess providing analysis. Sika is set to begin his 13th complete season with Columbus Crew SC after joining the club’s radio coverage full-time in 2007. Burgess, the Head Soccer Coach at Wittenberg University, will return for his 24th season on the microphone, bringing more than three decades of soccer-specific broadcast experience. All Crew programming will stream live on the FOX Sports GO app. FOX Sports GO, available to iOS and Android devices, provides live streaming video of FOX Sports content along with highlights and instant alerts for scores and key plays. Fans can download the mobile app for free from the Apple App Store and Google Play. Streaming on FOX Sports GO is also available on connected devices, including on AppleTV, Android TV, FireTV, Roku and Xbox One. Follow the networks and the Crew to get additional exclusive content and behind-the-scenes access to the team and the broadcasters. Columbus Crew SC (Soccer Club) is the first club in Major League Soccer. Crew SC is operated by The Edwards Family and The Haslam Family. The Black & Gold won their first MLS Cup championship in 2008 and also won the 2002 Lamar Hunt U.S. Open Cup as well as MLS Supporters’ Shield titles in 2004, 2008 and 2009. The 2019 campaign is the Crew’s 24thseason in MLS and the 20th season at historic MAPFRE Stadium — the first soccer-specific stadium in the United States. The Club has qualified for the MLS Cup Playoffs in four of the last five seasons, including winning the Eastern Conference Championship in 2015. FOX Sports Ohio and sister network SportsTime Ohio present more live, local sports programming than any other network or broadcast system in the market, producing over 750 live sporting events including 4,800 hours of live and original programming every year. FOX Sports Ohio is also the television home of the Cincinnati Reds, Cleveland Cavaliers, Columbus Blue Jackets, Cincinnati Bearcats, and ACC and Big East football and basketball while SportsTime Ohio is the television home of the Cleveland Indians and Cleveland Browns as well as golf and sports talk programming. Together, the two networks reach over five million households in Ohio, Kentucky, Indiana, western Pennsylvania, western New York, and West Virginia. For complete regional sports news, telecast schedules and updated statistics, log-on to www.FOXSportsOhio.com.